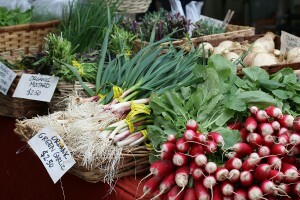 Bike, take the bus or walk to the Bellingham Farmers Market. Parking can be tight, so skip the hassle of circling downtown in your car and hop on your bike, lace up your shoes or catch a ride with the Whatcom Transportation Authority. You say you need your car? Choose the Commercial Street Parking Garage (formerly known as the Parkade before marketing-minded city employees renamed it). Regardless of what you call it, the five-story garage on Commercial Street is within easy walking distance of the market — and parking is free on Saturdays. Consider biking to the market this summer. Photo courtesy: Bellingham Farmers Market. Whatcom Smart Trips has joined with the Bellingham Farmers Market to encourage more folks to bike, walk and ride the bus to the popular Saturday Market. Make a Smart Trip to the market in August and September and you could win big — two randomly chosen participants that log their Smart Trip at the Information Booth with each visit to the market will be entered to win. The winners of two drawings — one for August and one for September — will each win $500 in a combination of Market Bucks and farmers market merchandise. Bring your own bags. It’s Bellingham. This is pretty much a given no matter where you shop. But BYOBag is especially important at the Bellingham Farmers Market where farmers don’t have the option of paper or plastic. Sturdy, washable canvas or nylon bags work best. Bonus tip: If you don’t intend to use the veggie tops, ask the farmer to remove and compost them for you. Removing the tops saves room in your bag and keeps vegetables fresh because tops rob produce of water. Bring cash – preferably small bills. Farmers aren’t able to run to the bank for change during their market shifts. Help them out and come with small bills they are easily able to cash out. There are ATMs nearby, but save time and get cash well before you head out to the Market. Buy in bulk. You’ll get the best prices when you buy lots of produce at its harvest peak. Buying in bulk also allows you to try new recipes and to freeze or store for times when today’s bulk purchase is no longer in season. Leave your dog at home. Crowds, food and dogs don’t mix. There are a lot of great places to bring your best friend; the Saturday Market isn’t one of them. If you want to enjoy the market with your furry companion, come on down to the Wednesday Market in Fairhaven where the smaller crowds and Village Green provide a safer environment for your four-legged friend. Respect the produce. Don’t squeeze the product or pick through tender produce. Ask farmers to help you find perfectly ripe items. Ask for recipes. Farmers often have great, simple recipes that help seasonal vegetables shine. Bellingham Farmers Market demos add a layer of education to your market visit. 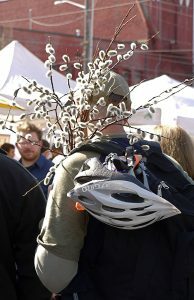 Photo courtesy: Bellingham Farmers Market. Ask for seconds. If your veggies don’t need to look perfect (soup, pesto, sauces, jams, etc. ), ask farmers if they have imperfect vegetables they are willing to sell at a lower price. Shop early or shop late. For best selection, shop the market early. Popular seasonal items often sell out. Arrive at the end of the day for the best deals. But don’t expect deep discounts. Market sales are an important source of income for hard-working local farmers. The Market also tends to be less crowded at opening and end of day. Take advantage of Demo Days and Chef in the Market events to learn more about seasonal products. Demo Days, a collaboration with Sustainable Connections, showcases simple ways to prepare seasonal produce. Join us the second Saturday of each month from May to October. Look for the big yellow sign near the Market’s Information Booth. Upcoming features include homemade pesto, zucchini dips and preserving tomatoes. 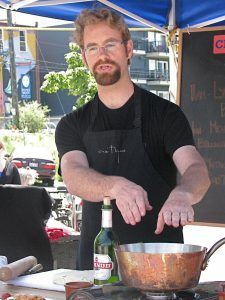 Or, watch the experts at Chef in the Market, the third Saturday of each month. Two chefs from the Northwest Washington Chef’s Collaborative team up to create a delicious dish showcasing local ingredients and partnerships with local farmers. Come hungry and curious. There are lots of samples and recipes so that you can try it at home. Stay in touch with Bellingham Farmers Market events through social media, the Bellingham Farmers Market’s Newsletter and the Bellingham Farmers Market online.